What is haluski? 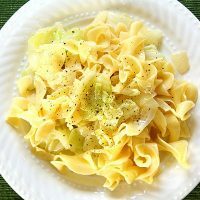 Haluski is a buttery Polish dish with egg noodles and fried cabbage often served during Lent and is the perfect recipe to use up leftover cabbage. Very popular in Pittsburgh! Are you familiar with haluski? Is it a Pittsburgh thing or something? I know you’re expecting dessert, but I have a problem. Nobody out here in south central PA knows what haluski is. It kills me because it’s one of the easiest dishes you can throw together. Haluski is a Polish dish of cabbage and noodles that I’ve eaten at least once a month growing up. You always find it as a side to fish fries during Lent. I made a big batch of it and brought it to lunch so I could educate my coworkers. They all asked for the haluski recipe, so it’s probably safe to say it was a huge success. 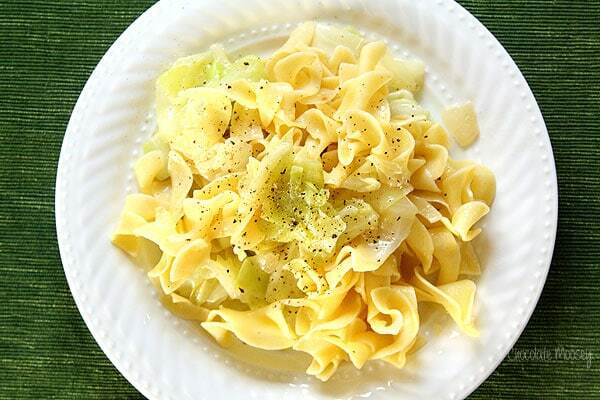 Haluski is egg noodles tossed with sauteed cabbage, onions, and butter. It is one of those dishes that I rarely make myself, mainly because my mom does it well. I won’t make pierogies myself either because that is another dish my mom makes with fried onions on top. I guess it’s because of the nostalgia tied to them since I grew up eating them during childhood. Ironically, nobody in my family is Polish. I guess it’s just something us Pittsburghers eat all the time regardless of ethnicity. Traditionally, the noodles are made from scratch. As ambitious as I am with my from-scratch philosophy, I’m pretty cool with buying packaged egg noodles. It makes dinner that much faster and easier. If you want to make your own noodles, here’s a recipe for homemade egg noodles from Neighborfood. First, you saute onion and cabbage in butter. Lots of it. Once the cabbage is fork tender, add the cooked egg noodles and toss. It’s that simple! My mom also has a habit of putting lots of black pepper on top of things. Normally I’m good without it, but no matter how hard I try, I can’t eat haluski without black pepper. Not sure how to cut cabbage? Here are some tips to make it easier! Before you begin, make sure your chef’s knife is super sharp. A dull knife means you’re more likely to slip and cut yourself on such a sturdy vegetable. Place the cabbage on a cutting board with the core side down. This gives it a little flat bottom so your cabbage isn’t rolling everywhere. Slice the cabbage in half from top to bottom, straight through the core. Then place each cabbage half cut-side down and cut in half again, vertically from the top through the core. You should now have 4 quartered pieces. Each quartered piece will have some core at the bottom. Place each quarter cut-side down and cut off the core at a slight angle. Focusing on 1 quarter at a time, slice into vertical strips. Then slice each vertical strip into pieces for haluski. To make haluski even faster, chop up the whole head of cabbage at once and keep leftovers tightly sealed in the refrigerator. That way when you’re worn out from a long day at work, you can throw things in a pot and have dinner ready in roughly a half hour. As you can see in the comments below, haluski has multiple names and origins. Share your favorite memory with me! Haluski is a buttery Polish dish with egg noodles and fried cabbage often served during Lent. Very popular in Pittsburgh! Bring a large pot of water to boil. Once boiling, add a big pinch of salt and egg noodles. Cook according to package directions, roughly 10-12 minutes. Drain when done. Meanwhile, in a large Dutch oven over medium heat, melt 6 tablespoons butter. Add the onion, cabbage, and a big pinch of salt. Saute for 15-20 minutes or until cabbage is brown and fork tender. Add more salt to taste, if necessary. Add the cooked noodles to the cabbage mixture and toss to coat. If necessary, add the remaining 2 tablespoons butter. Season with black pepper. Stuffed Cabbage Soup – It’s like making stuffed cabbage rolls but without all of the work. Thai Sweet Chili Shrimp with Cabbage “Noodles” – If you’re looking to cut back on carbs, these cabbage “noodles” are fun to make. Coleslaw for Slow Cooker Shredded Beef Sliders – Who doesn’t love a good coleslaw recipe, right? I have not heard of Haluska but it is now on my must try list! My husband;s Polish family has been having Haluski every Father’s Day since I married into the family (42 yrs. ago) and before. They add small curd cottage cheese into the mixture once it is all blended. It sounds gross but tastes wonderful. I was a very particular eater when I married but it is now one of my favorite dishes. You have to add the cottage cheese quickly as it will cool the other ingredients. I always make mine in an electric skillet and stir it in there to keep it warm. Their other custom is to always serve it wish fresh rye bread. I’ve never heard of adding cottage cheese, so now I’m intrigued! My Polish family has made this with cottage cheese as well! The only difference being that when it contains cottage cheese, we always used spaghetti noodles. Without cottage cheese, then egg noodles. Oh why the different noodles for cottage cheese? We didn’t add cottage cheese, we added sour cream. We also added in kielbasa. Nothing says Pittsburgh like kielbasa! Love the addition of kielbasa! Totally Pittsburgh. This looks quite good…and buttery :) My European mother made a lot of stuffed cabbage when I was growing up but not this particular cabbage variation. I love that you posted this haluski recipe! I first learned about haluski a few years ago and made it as a side dish for Thanksgiving. I personalty loved it. My mom’s side of the family is Polish, but I’ve never had haluski! (I wonder if it is a Pittsburgh thing…) If ever you have a craving for this and you’re wondering what to do with the other half head of cabbage, you should make holishkes (stuffed cabbage, but Epicurious has a wonderful recipe with a cinnamon-orange-tomato-based sauce that adds a warm, comforting spice). Now I want to go home and eat pierogi with my mom! It’s Pennsylvania Dutch which is polish. Not usually made with anything else except an optional meat like corned beef or kielbasa. This is a very good authentic version. Pierogies if you serve them are also cooked sauteed in butter and onions which is the PA Dutch way to prepare them. I’m not sure why people from PA or that region are unaware that they are PA Dutch. They are cooked and served all over at state fairs, festivals, all over the trip state area. It’s a Shane all of the younger people are loosing the knowledge and heritage from the area we live. Thank you for the additional info. When you walk around Pittsburgh, it’s identified as Polish with no mention of PA Dutch, so that’s probably why we’re unaware. I am Pennsylvania Dutch, from the Hegins Valley….which is not at all Polish. Pa Dutch emigrated from Germany. I never heard of, nor had haluski until I met my husband. We grew up about 20 miles from each other. His mom was Slovak and taught me how to make it. I’m from CT, my family has been eating this for generations passed from my great grandmother who came to the US from Poland over 100 years ago. It’s def not a Pa Dutch (German) recipe. Never heard of haluski! But, we love fried cabbage, so I know we’d love this! YUM! Well I’m Polish, from NEPA and then I married someone in central PA who’s family was from Russia and pretty much ate all the same foods my Polish family grew up with, even though the rest of this area isn’t as familiar with it. I’ve eaten lots of haluski! It’s very popular at church picnics in NEPA. I like lots of cabbage and I like to cook my cabbage a long time. I prefer homemade noodles but there are plenty of good egg noodles on the market out there. I sometimes use a healthier egg noodle. I’ve cooked the cabbage and froze it separately to be thawed and added to freshly cooked noodles later. I’d eat it more often but I hate having my house smell like cabbage. What part of NEPA are you in … I live in Nanticoke….. the first time I tried haluski ( tonight) I loved it .. 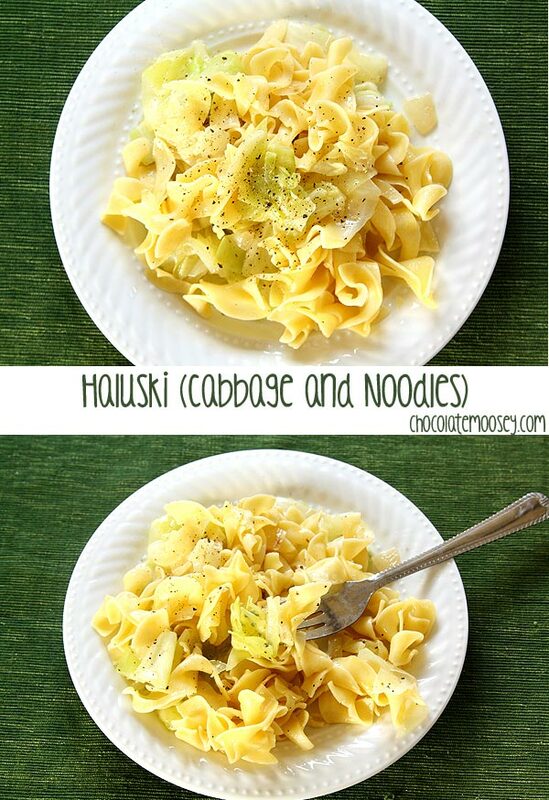 I had never heard of haluski until now but looks and sounds like the perfect weeknight meal! I’m from NEPA too and I make this (even posted it) and sometimes I add bacon or turkey bacon! From the area also, but have to say my mother always added a bunch of caraway seeds to the cabbage while cooking. Adds to the rustic taste. Nope. Never heard of haluski. But it looks buttery gooey and delicious, so I’d be willing to give it a shot. But those noodles look aweeeesome. I made this the other day, but couldn’t find the link to your website, so I had to G**gle to find another one. Mine had the addition of crispy bacon and had garlic powder instead of fresh. I was thrilled because I actually crave cabbage! That’s odd isn’t it. Wonder what it means. Thanks so much for the recipe! I love this dish! My grandmother was Czech born but moved to Pittsburgh as a young girl. She always made a haluski soup, that I still make today, and it is my absolute favorite food in the world. It’s really just chicken soup with a dumpling-like noodle. It was always my understanding that a “haluski” is really just a noodle, but the term is often used to name any Czech dish that contains noodles. It’s interesting to see the debate about what a “haluski” really is, because everyone seems to have their own variation. I’m originally from a small town near Warsaw, Poland and Haluski is called kluski (noodles) where i was raised. The regions and dialects, I guess change things a bit, but it’s still all European Noodles and Cabbage. Thx for such an interesting culture treat. I definitely have to try this dish to feel like I’m home again. Thx. Thanks for the info about kluski! Yes! I am just south of Pittsburgh and we LOVE haluski. Everyone makes it around here ( especially at church functions, holidays etc) . I grew up in NC and never heard of it until we moved to Pittsburgh. Now I make it once a month or more. I am from Morgantown W.V. ( close to Pittsburgh). I actually just made this for the fouth of July for my boyfriend’s family, I am living in Puerto Rico, so no one has ever heard of this dish. In W.V. We always add bacon to the dish. No matter where I am everyone loves this! I am from the Cumberland, Md. area near Morgantown, W.V. I just had haluski for the first time yesterday at a car show in Oceola Mills, Pa and loved it. I’m looking forward to creating haluski myself. Another good thing you could do with the rest of the cabbage is make a German/Russian dish called Haloopies (hal-oh-p-sees). It is basically blanched cabbage leaves stuffed with rice, ground beef, and onion, then baked in salt water. You can top it with sour cream or tomoato sauce…yum!! I’m actually eating haluski for lunch right now! 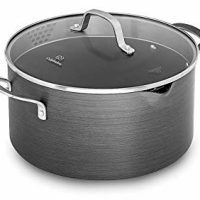 I made a pot and just wanted to compare my recipe with others out there on the internet which is how I stumbled onto your site. While we live in Virginia now, we are originally Pittsburghers and it is so nice to hear that someone else feels the same way we do about PGH cuisine. We still eat haluski, halupki, pierogies, etc. Oh, we’re not Polish either. I guess it’s just something our families picked up from living in the area. I grew up eating Haluski …. I’m from NEPA. My husband is part polish and absolutely LOVES haluski … I’m actually making it tonight for dinner! This dish is huge in Cleveland/Ohio. I live in a suburb called Parma and we have a huge East Euro population, Polish and Ukranian. Pierogies, Cabbage and Noodles, Stuffed Cabbage and Potato Pancakes are everywhere. I think the dish is popular if the culture influence is there. I’m full blooded Italian but I have to say that East Euro food is one of my favorites. In my city we’re known for Pierogies and Cabbage and Noodles, even have it at Fairs., city, county and state Famously called Parma Pierogis are the best! Bill Clinton and Barack Obama both came here to eat pierogies and other East Euro foods. I add this dish to my New Year’s Day menu. I love Cabbage & Noodles! Have a Happy New Year! I follow you in all the sites!!!! my austrian/slovak grandmother made this dish often, also homemade pierohies. i’m just a bit north of Pittsburgh and know these dishes are very popular there but i think it’s more of a heritage thing thing than a Pittsburgh thing, though many polish/slovak people did settle in the area. i make this with pork roast for new year’s instead of saurkraut. you can’t go wrong with this sweet cabbage and noodles dish and it’s much more palatable- so many people dislike saurkraut but cabbage on new year’s day with the pork is mandatory! it wins over cabbage-haters if you can get them to taste it once! so simple, so delicious! so old school home cookin good stuff! Hello. I am of Lithuanian descent and grew up in an industrial Connecticut town. My mother always said that pork had to be served on New Year’s Day to ensure a healthy and prosperous new year. Presently, I live in Boston and when visiting the South Boston Lithuanian Citizens’ Club, I asked about the pork-on-New-Year’s-Day tradition, and no one there had heard of it. Do you know where it stems from? I ask because I love ritual and tradition. We eat pork on New Year’s as well but not sure where it stems from. Thank you for responding, Carla. It is a comfort to know others will be enjoying the tradition of pork this coming New Year’s Day, and we’ll raise a glass to you and your family! I am making this today for first time..it was recommended to me by a friend that makes this to use Kluski egg noodles for even better taste than regular egg noodles..I found them in one of those natural markets but I heard walmart or some grocery stores carry them . I think calling it haluski is the problem. I can never keep the Polish words straight. haluski, crusciki .. It’s all a blur. Everyone loves cabbage and noodles! Yes! Yes! Yes! Thank so much for this! My grandparents lived in PA for most of their lives and she always makes this! This is awesome, whipping up a batch right now! Just hd halusky yesterday at a Catholic Church in Washington,Pa.Friday Fish Frys in Pgh are the best.Travelled from WV because its Lent!..No one down here has ever heard of such a thing.Thanks for the reciepe. Yes fish frys are back in season! I also wonder if that’s a Pittsburgh thing because where I moved to, they don’t have fish frys here. They do celebrate Lent, just no fish frys. We had this for Sunday lunch. This was very good and I know I’ll enjoy the leftovers for a lunch or two during the week. I’m from south central PA and I definitely know what Haluski is! And a truly good haluski needs to be made with homemade noodles. There is a town right across the river from my hometown 30 miles NE of Pittsburgh. Every year this tiny place has a festival called Ethnic Days where they serve all Eastern European dishes. Haluski and pierogies are always there. I think fish frys started maybe in Wisconsin. Chicago and Wisconsin have tons of restaurants that have fish fry EVERY Friday year round. I think VFW ones are best. I do think Western Pa. has lots of Eastern Europeans so those dishes are very popular there even tho Chicago has the largest Polish population outside of Warsaw. This looks interesting. I’ve never had Haluski but it looks like a great Meatless Monday dish. Pinning this one too! I made haluski a couple of times in the last 6 months for the kids at the pre-k center where I work. Something magical happened the last time I made it! I fell totally and completely in love with haluski, which I call Polish soul food! I think it is so good and such a down to earth, country, peasant food kind of dish. I applaud haluski!!! I too am from the Pittsburgh area (Washington, PA). As many people have stated, it’s very popular in this area and always on the menu at church functions, wedding receptions and during Lent. Long live haluski! If you haven’t tried it, what on earth are you waiting for??? Agreed! I love cabbage, and usually when I buy a head, I know it’s going to be enough for 4-5 recipes. And sure enough, one of those meals is definitely haluski. I am a Pittsburgh girl gone South. (Moved to S.C. a couple years ago) I REALLY MISS all the ethnic food from Pittsburgh!!! So my recipe is the same as yours, only after cooking mine in the frying pan, I bake it in a blue speckled roasting pan for 30 40 minutes. To me, that gives it the “Friday Church Fish Fry taste” ! LOL (FYI- they NEVER heard of that either down here…) My family devours it- even the Californian daughter -in- law who’s never heard of any of my “Pittsburgh” dishes. But she sure liked the “Cookie Table” at her wedding- at my insistence! I’m from Harrisburg, and growing up, we had Cabbage & Noodles about once a month as well. Too bad I didn’t have a taste for it when I was young. Thanks to people such as yourself, keeping it alive, I can get my fill now! I grew up on the Hungarian version of this dish. It was simply chopped cabbage sautéed in bacon fat, with small pasta shells and lots of black pepper. Seeing this brings back very fond memories. I love haluski!! I grew up near Pittsburgh and this was always on our table. Still a favorite ( I am making tonight) and definitely a staple during Lent!! Oh absolutely during Lent! When I lived mid state for 4 years, nobody did the fish fries like Pittsburgh does. Now that I’m back, I can’t wait to start going to them again. I tried your Huluski tonight for dinner; it was so good that it wasn’t around long enough to take a picture. Thanks for the recipe! Always a good sign ;) Glad you had a great dinner! I just made this for the first time and it was exactly how I remembered it when my aunt had me try it at an autumn festival in Bedford, PA. She said it was a common dish in PA and that’s all I needed to know to love it! She lives in Altoona and my grandparents lived in Rimersburg. I’ve spent a lot of time learning food dishes from that area to carry on family traditions. It keeps my grandparents close to my heart! I know all those places too. I grew up in Johnstown and now live just outside Pittsburgh. My family is Ukrainian. I grew up on haluski, peroghi, halupki, vereniky etc. I just made this dish for the first time myself and its been probably 8 years since I’ve had my family’s. This is exactly how I remember it. Thanks for the nostalgia. I have eaten cabbage and noodles since my kids were young. A babysitter taught us how to make it. I never knew what it was called until now. It’s just always been cabbage and noodles to us! A life saver for a single Mom of 3! Cheap meal, kids love it, what could be better? my kids are all grown and their kids are all grown but everyone still loves this simple dish! Oh I absolutely agree! When I buy a head of cabbage, I can easily get several meals out of it (granted I’m only one person), and cabbage is cheap to begin with. When I don’t know what to make for the week, I usually end up with cabbage and making haluski. Haluski is a Slovak dish in my family. Haluski is a potato dumpling. My Great Grandparents came here early 1920’s and Grandma Novak made it with the dumplings, sauerkraut and fried chopped bacon and onions. My father continues to make it and it is heavenly!!!! In a simpler form, this is Hungarian peasant food. The version I grew up on was small macaroni shells mixed in with chopped cabbage fried in bacon fat, and lots of black pepper. Yum! Haven’t made that in years. The name is different in Hungarian also, but I don’t know how to spell it. I grew up eating this in Texas; my Polish dad is from Pittsburgh! My mom made haluski at least twice a month. Love it! Still one of my favorite comfort foods. Hi! I made this dish yesterday and it was really good! I was wondering if there is a side dish that you would recommend to eat along with it? If you want to be a true Pittsburgher, the answer is pierogies ;) We usually eat garlic bread with it since it’s pasta, but you can also do a salad to help balance the butter. Or you can make the haluski as a side dish and serve something else for the main. Haluski is often served with fish for fish fries during Lent. Love the idea of adding kielbasa! I’ll have to try that myself. My father was Hungarian and I grew up on a version of this that I made just last week: macaroni shells with chopped cabbage that has been sautéed in bacon fat. Mix the pasta and cabbage together and add lots of black pepper. It’s about the only dish from my childhood that I still like and enjoy. It doesn’t need onion, garlic or anything else. Love the addition of bacon fat! Sorry to disappoint you but I grew up in Northern New Jersey and ate this all the time as a child. My father was first generation polish and my mother was from Denmark. We called this ‘Noodle Mush’ as a kit. My mother sautéed bacon and sliced kielbasa, removed from pan and into drippings sautéed onions and sliced cabbage until tender. 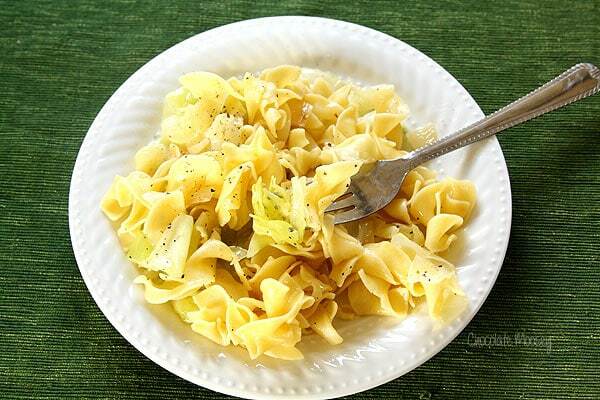 A package of cooked egg noodles was tossed with the cabbage mixture and about a half stick of butter. A good tablespoon of caraway seeds and then the cooked bacon and kielbasa were tossed in Try it with the caraway seeds, I think it is the best part. Hope you enjoy my families version. I’m from the Pittsburgh area and we have eaten Haluski as long as I can remember. One of my aunt’s made it for every family occasion we ever had. Her’s is the best! I don’t know what she does different. I have been so hungry for it since I seen this, so I’m making it right now. Probably added a little bit of love ;) Glad this recipe brought you back memories! I grew up in south central PA (Littlestown) and my Polish grandma used to make this all the time, although most of my friends didn’t know what it was. I love it!! I’m making this now and it’s great because it’s so simple and tasty…I added a bit of bacon fat and am liking the flavor very much! Love the addition of bacon fat! It makes everything better. Halusky is a Slovak dish… Slovak, not Slovenian. I’m sure various Eastern European countries have variations. Love it! My Slovak great-grandma made this ALL THE TIME! She was originally from the Rankin area of Pittsburgh. Then my great-grandparents moved out to the suburbs – North Huntingdon in 1959 after my great-grandfather had worked in the steel mills for over 30 years – last one was Irvin Works. I grew up eating haluski, pierogies, stuffed peppers, stuffed cabbage (the Slovak version truly has NO tomato sauce, but instead has sauerkraut and is thickened by a roux called “zhapraska” (sp?) Which is just a blonde roux with the addition of onions. I LOVE PITTSBURGH!!! I miss my hometown all the time! I’ve lives in Los Angeles since I was 7…I’m now 46. I spent all my childhood summers in Pittsburgh though. I’m so thankful for that. Damn…now I want to go to Kennywood!!! My hometown is North Huntingdon :) Small world! This looks so simple yet delicious. We love buttered noodles in our family but I never knew that Polish tradition added the fried cabbage. I’ll have to give this variation a try. I think you’re going to love it more than regular buttered noodles! I love how simple this recipe is- only a few ingredients, but put together, it sounds beyond delicious! Definitely going to have to try it out! One of the easiest dinners you can throw together! I’ve never heard of this dish before but it sounds easy and delicious! I can imagine it’s a great base for some many variations as well! I know a lot of people who add bacon to it as well. I’ve so enjoyed reading all the memories of people growing up in PA and eating this dish.I am half Polish and grew up in northwest PA on the NY border. I’m so anxious to make this dish for supper tomorrow night. We’re having roast beef and homemade applesauce with the cabbage and noodles. Company is coming! Sounds like a wonderful family dinner. Enjoy! I live in Virginia now, but I’m an old Pittsburgh girl at heart. Two nights ago we made a huge roaster full of Hunky Hand Grenades (Stuffed Cabbage Rolls) and being as I had one head of cabbage left over, I decided to make a big old pan full of Haluski. I think that yinz have the best recipe I’ve seen so I’m going to give it a try. Thanks. Hunky Hand Grenades?! Now that’s a new name for me! I do the same thing with leftover cabbage. When in doubt, make haluski ;) Enjoy! When I was growing up in central Pa about 10 mins from Harrisburg my family made this at the Bloomsburg fair every year as well as pierogies. All home made of course and it was made with the square homemade pot pie noodles and cabbage also had a little bit of a broth to it. Not soupy just enough to help it all stay moist and hot. It was amazing. Oh interesting about the broth! I’ll have to try that and see how it goes. Wow this is super easy and I bet it taste absolutely amazing. Love cabbage this time of year. I will save this recipe and put it on my next week family menu. My boys will love this I’m sure! Keep me updated on how it goes! I am half Slovak and grew up in Pittsburgh. My mother made halushki but with homemade dumplings. I do itnthe lazy mans way with store bought egg noodles. Secret to deliciousness is browning the cabbage and Visalia onion. My Irish daughter in law loves it. Yes browning always makes it better! And don’t worry – I use store bought noodles too. Maybe some day I’ll try making my own, but that’s more of a weekend project. Can I make this the day before and reheat in the oven? I’ve never tried it, so I’m not sure. I’m guessing it’ll dry out so you’ll have to add more butter. You’ll also want to make sure you don’t overcook your noodles. Another way is to cook the cabbage and onions ahead of time then cook the noodles and add them when ready to serve.